The war in Syria has been going for some time now. Imagine there were no refugee crisis: would this kind of large scale crisis have bothered the developed world then? The refugee crisis diverted attention to Syria as refugees started flocking into European territory through Turkey, and all of a sudden Europe had to welcome millions of refugees. One should look at the root of the Syrian problem by looking into history. After the collapse of the Ottoman Empire, the British and French ruled the Middle East for a short period of time between 1923 and 1946. Syria—built on the multi-ethnic, multi-religious/sectarian and, more importantly, the ethnic and sectarian differences of the administrative structure—has complex internal dynamics controlled by the collapsing authoritarian structures, which has resulted in a drift towards chaos and disaster. In other words, Syria is a made up country where a line was drawn in the sand by the French to show its borders. Even after 1946, France controlled minority groups in the country while Russia always kept Syria at arm’s length to have direct access to the Mediterranean Sea. As a matter of fact, Basher Asad’s father Hafez al-Assad allowed the Soviet Union to open a naval military base in 1971. Currently many different parties are fighting in Syria and using the country as a place to exercise their own government policy. In brief, here is each country’s agenda. Russia wants to make sure that it continues to access the Mediterranean through Syria. Israel does not want the regime to change to an Islamic government where its sovereignty could be threatened through Golan Heights, as Syria is a neighbour of Israel. Iran wants to make sure that the Shia population continues to live in the region peacefully. Turkey generally believes that the northern part of Syria belongs to Turkey and there is a fear of a Kurdish state being built there. France wants to continue to enjoy some privileges and have cultural and economic influence over the country. The USA has become more serious about Syria since Russia officially got into the game. As there are no really significant natural resources there, such as oil, the US had no interest in the country in the beginning. Saudi Arabia is flexing its muscles against Iran. Bear in mind what is going on in Yemen right now. We have the Iraqi example from recent history in the region. After the war, stability could not be secured in the country, and therefore the transformation process is still in progress with no real deadline. Elected governments must always be respected in any part of the world. For this reason, a secure election is needed in Syria to bring about a transformation. I personally do not see transformation without Assad, as there is no real counterparty other than Assad. Would you like to deal with Free Syrian Army, YPG, Daesh or someone else as a counterparty or at least a somehow elected government? Russia is definitely a game changer in the Syrian issue. The country’s involvement has only made a complex issue even more complex. There are a lot of questions and answers to be agreed upon unless we can move towards a solution in Syria. What should happen to Assad? How can we create a path for the immigrants going back to Syria after the war? 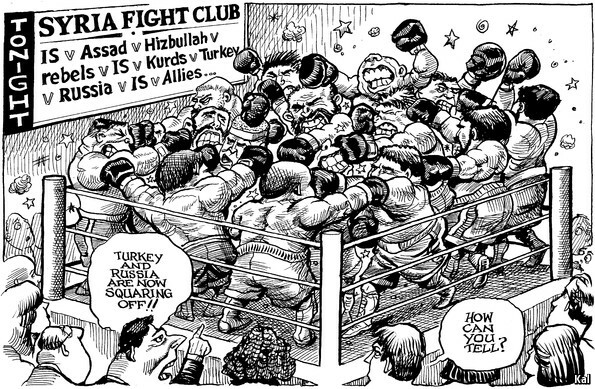 Will some groups that are fighting in Syria today get some concessions after the war? Syria is now exporting terror to the outside world—Jordan, Lebanon, Turkey and Europe. The issue has to be resolved sooner rather than later. These questions are complex questions with no definite answers. Only time will show us the outcome, and I hope it will not be a shameful landmark for humanity. The market has tumbled quite a bit since the beginning of the year and financial and energy companies are the main losers. Warren Buffet’s famous quotation is, “Be fearful when others are greedy and greedy when others are fearful.” Even though the current climate is quite fearful, I would personally continue to be fearful rather than greedy in the coming months. Financials are getting sold off as the street is expecting loan books to deteriorate and non-performing loans to increase and energy companies are being sold off since the investors do not believe that the juicy profits will be there anymore for an extended period as all the commodities across the board have been sold off sharply since last year. The market always likes to overreact to any news. It is not a difficult prediction to make that the loan books are likely to deteriorate as the exposure to energy and other challenging sectors will likely bring some defaults in the near future. It is almost impossible to predict the price of oil as the price has been affected by many factors rather than the simple supply and demand mechanism, but the longer the oil price along with other commodity prices continue to stay low, we will continue to experience more defaults. Due to this simple fact, I would rather try to get away from energy company bonds as much as possible, as well as heavily commodity dependent countries such as Venezuela. FED hiked the interest rates last December; many analysts started expecting three to four hikes in 2016. I don’t see that this is now happening. I would look for a one rate hike if we are lucky this year. Any aggressive stance from the Fed may shake the markets in a much uglier way. The 10-year US interest tumbled as low as 165 basis points, which is clearly a sign that the money is again flowing into “safe havens”. In 2015, many analysts were recommending getting into equities as they were seeing more value in equity markets than in the bond market. Those analysts were again wrong because since the turbulence start happening in June 2015, the bond market has performed relatively well compared with other asset classes. We are living in such a different era that nowadays many banks are charging their clients to deposit EUR, JPY and CHF with them. In the debt market, the EM debt crisis is approaching closer and closer as the currencies of these countries depreciated along with the revenues and it will be real challenge to produce USD for the repayment of the interest and the principal. Investing in quality names in the debt market will continue to be the challenge and one should not go simply for a high yield. USD is very likely to continue to be a main beneficiary as with the last few years. The spotlight is on “China”, but China is relatively doing better than its peers and I think the spotlight is again focusing on the wrong place. Beside all these challenges, Syria is likely to teach an important lesson to human history. 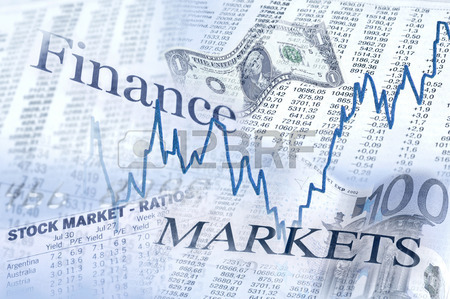 When there is a war, what happens to financial markets is not a difficult question to answer. Maybe gold is returning to its shiny days because of that? I would keep a large portion of my assets in cash along with buying some (5–10%) gold at these levels. I would actively seek an entry point for blue chip companies with a target holding period of three to five years. The lowest point the market hit was on 5 March 2009, and I would wait for that kind of a day carefully. In addition, high quality debt papers that can pay continuously 4–5% are still not a bad asset to hold for 20–25% of your portfolio. This is a period where you should protect your wealth rather than making a risky bet. I will be travelling in Kuwait and Istanbul this week before coming back to Singapore. Have a wonderful week ahead! 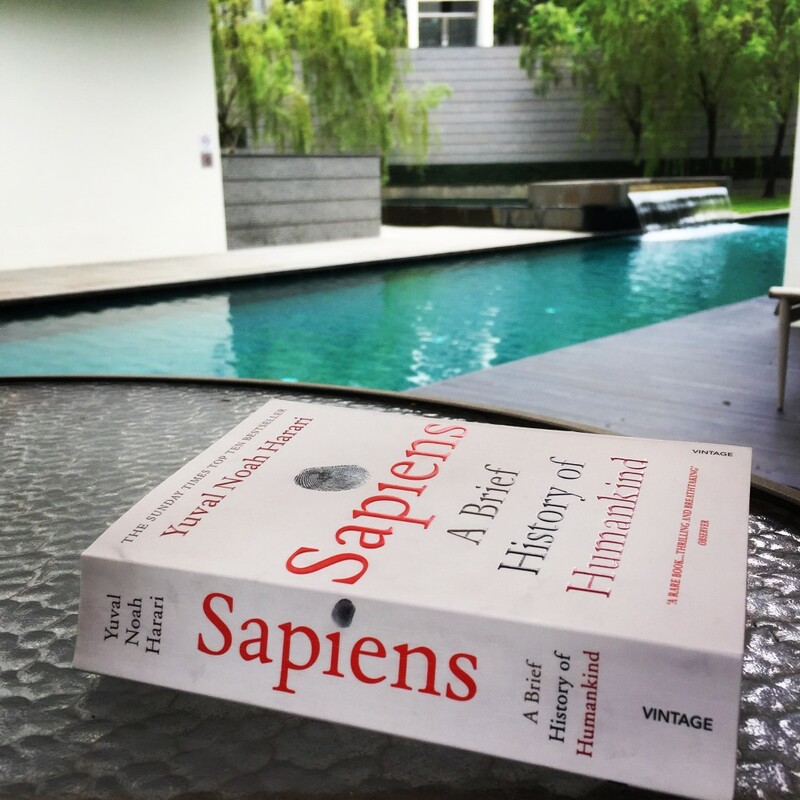 A couple of months back, I published my next five books to read and one of them was Sapiens. Since this week marked Chinese New Year (Gong Xi Fa Cai! ), it was a great opportunity to read Sapiens over the four-day break. I will share some of the author’s own sentences with my own comments and I hope that you find it interesting enough to read the whole book. The author, Yuval Harari, divided the book into four different parts according to humankind’s developments: the cognitive revolution, the agricultural revolution, the unification of humankind, and the scientific revolution. The author argues that prehistoric humans were insignificant animals with no more impact than gorillas, fireflies and jellyfish, and our closest living relatives include chimpanzees, gorillas and orang-utans. Legends, myths, gods and religions appeared for the first time with the cognitive revolution. The transition to agriculture began around 9500–8500 BC in the hill country of south-eastern Turkey, western Iran and the Levant. Yuval believes that the agricultural revolution was history’s biggest fraud since the average farmer worked harder than the average forager, and received a worse diet in return. He rightly argues throughout the book that worries about the future became major players in the theatre of the human mind. So true… Everything is happening because of a series of past events and it is important to evaluate the reasons and continue our lives accordingly. The scientific revolution started with human beings accepting the Latin injunction ignoramus, in other words “We don’t know”. This is still a huge problem in many countries as people think they know everything. Instead, when you accept that you don’t know enough, it opens the door to investigate, observe and learn. He explains the necessities of holding societies together in quite a comprehensive way and explains why scientific revolution took place in Europe rather than anywhere else. The scientific revolution has definitely increased our productivity, but has it really improved the overall satisfaction of our lives as well? The book also discusses this point in quite a nice way as well. This is another sad fact of our age. Because our distribution of goods and services channels are not well developed (or maybe we don’t want to develop?) whilst many people suffer from famine, some other people battle against obesity. He argues that there will not be a large-scale war in the future, which I don’t really agree with. He puts forward the argument that the economical benefits of peace are so great that countries will avoid a large-scale war. Even though the economic benefits of peace along with social benefits are huge, these benefits are being shared by only fraction of the world’s population. Due to this fact, I personally expect a large-scale war to arise from low income people if these issues are not addressed immediately. Overall, the book enlightens us about the series of past events that took place in the history of the humankind and it helps us to think why certain institutions, beliefs and behaviour exist in our lives. I rate this book 5/5 and recommend you to read it as well. Yuval Harari also has a website where you can watch his videos and even subscribe to his public courses. Since I was expecting my baby, we had been unable to travel around much over the last month, and it is not easy to travel with a newborn. The desire and intention to travel has been always there for our family so we decided to go for a quick weekend getaway to Bintan Island in Indonesia. A lot of my visitors in Singapore ask me where they can go from Singapore easily. This is the easiest option to travel from Singapore, since it only takes 45 minutes by boat to reach the island. I booked the ferry tickets through Bintan Resort Ferries (www.brf.com.sg). The booking process was a bit complicated, as the website requests all passengers’ passport numbers, passport expiry dates, etc. I had been to Bintan in September 2013 where we stayed at Bintan Lagoon Resort and we were not happy with our experience. The property was old, the breakfast was awful and it was overpriced. Bearing in mind the previous experience, I booked the Angsana Hotel for this visit. The ferry leaves from Tanah Merah ferry terminal, which is very close to Changi Airport. The immigration process is fast and smooth at the ferry terminal. We took the ferry out at 08:10 am and luckily we found a good spot on the ferry as we needed mobility because of the baby. After almost an hour, we arrived at Bintan. Among the changes since our previous trip, Indonesia has initiated visa free travel to many nationalities, including those with Turkish and British passports. Before, there was a visa check on arrival and you would need to buy a visa for USD 15. Getting the visa was easy, but the queue and securing the exact USD 15 was a bit of a hassle. Once we were through immigration, the hotel had arranged a complimentary transfer from the terminal. Angsana is only ten minutes away from the terminal, which was great. The hotel is in an old complex and has a friendly staff. It has a long private beach and is situated just next to the Banyan Tree. We were able to access our room before the standard check-in time and headed to the beach, where there is a nice restaurant. The menu is quite simple there but the food is good. Unfortunately, like anything in Bintan, it is very overpriced, though. The hotel provides beach chairs along the beach, with towels. Even though the sea in Southeast Asia is not my favourite, given that it is hot and not crystal clear, it is nice to lie in front of it and relax. We visited the Saffron restaurant—which is inside the Banyan Tree—for dinner. I should say the highlight of this trip for me was this restaurant. Perfect food, nice ambience and great service. Even though we had some small communication problems at Angsana Hotel, I would say they are fairly friendly and do try their best to make sure you feel comfortable. On the way back, they arranged a private transfer for us to the ferry: since we had our newborn with us, it was a great gesture. In Bintan, everything is overpriced. Proximity to Singapore and an easy tropical escape make the place popular so the prices are high! Once every two years, though, it is a good place to visit. 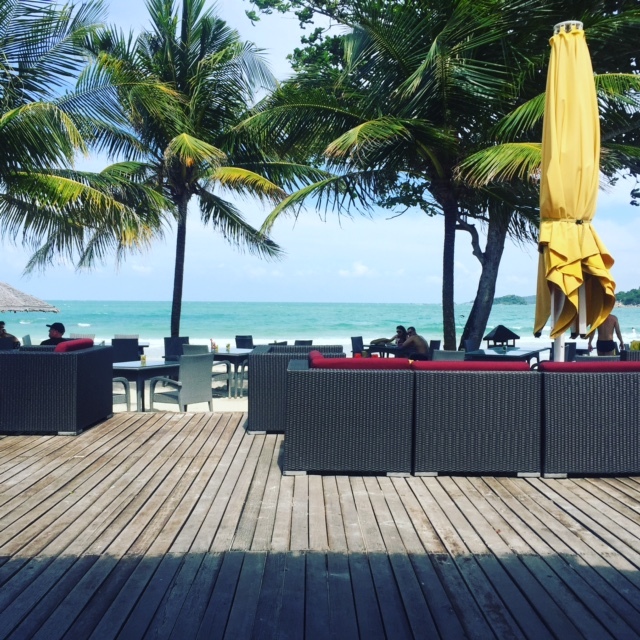 If you are visiting Singapore, I would recommend that you spend two or three days in Bintan.